Blotch and Thrum: still more shirts! Just got these out of the dryer. Some well timed naps got me to where I am, also, soy wax totally comes out with hot water and soap! So, you can skip the "wait for the shirt to dry and then iron out the wax" steps! And do the whole thing in like two days! Or one day if you get up early enough. 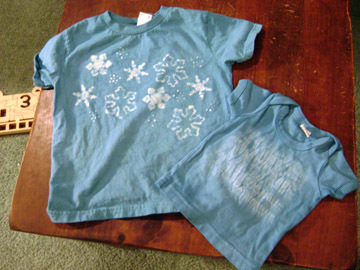 Left shirt was low water immersion dyed a light green color, then I used a stencil borrowed (with permission) from my child's preschool to do the snowflakes, the dots were done with a brush and the top of a spice bottle. The right is just stitched shibori. I was considering adding a print on top, but I like the look... for now, I could always go back, yeah?